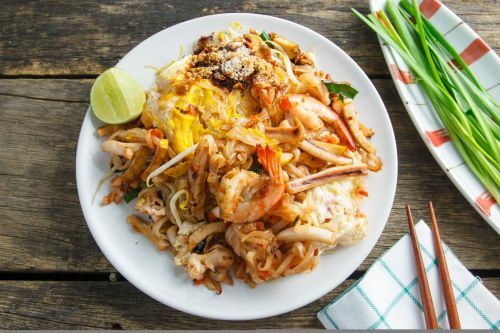 Thai Kitchen by Paula uses their own specialised couriers to deliver their food. Vermicelli, sliced cabbages, Chinese mushrooms, chopped mixed vegetables, shallots, coriander and garlic wrapped in deep fried pastry. Served with sweet chilli sauce. Deep fried tofu until golden and crispy on skewers, served with peanut sauce. Potatoes, onions and carrots with curry powder, wrapped in pastry and deep fried. Served with sweet chilli sauce. Filled with marinated minced chicken, rice vermicelli, lettuce, cucumber, shallots, coriander and mint leaf. Wrapped with fresh rice paper, served with tamarind dipping sauce. Marinated Thai chicken wings, deep fried and served with sweet chilli sauce. Minced fish with Thai spices and herbs, deep fried and served with sweet chilli sauce. Duck wrapped in thin pancake with cucumber, shallots and special sauce. Combination of shrimp and crab wrapped with rice net paper served with plum sauce. Mixed chicken and vegetables wrapped in pasty and deep fried. Wonton dumplings filled with chicken and prawns. A combination of a spring roll, curry puff, fish cake and satay chicken. Light battered tender squid topped with garlic, chilli, shallots served with sweet chilli sauce. Thai style fried rice with egg, sliced onion, diced carrots, shallots and cashew nut. Deep fried egg noodles topped with mixed seafood in Thai gravy sauce. Combination of prawns and chicken stirred with dry sultana, pineapple, carrot, shallots, capsicum and cashew nuts. Mixed seafood in combination of basil, chilli, lime leaf, young peppercorns stir fried in Thai country style sauce with seasonal vegetables. Grilled salmon with creamy green curry sauce and steamed mixed vegetables. Grilled lamb cutlets with chili basil sauce and steamed mixed vegetables. Stir fried crispy pork belly with chilli, garlic, hot basil, bamboo shoot and mixed vegetables. Crispy pork belly stir fried with Chinese broccoli, garlic and carrots. Chargrilled chicken marinated with original Thai herbs and spices, served with sweet chilli sauce. Grilled marinated pork neck served with Thai style chilli dipping sauce. Slices of grilled marinated beef, served with steamed vegetables, sticky rice and Thai style chilli sauce. Deep fried crispy fish fillets (cutlet) with chilli, garlic, hot basil and mixed vegetables. Stir fried pumpkin with egg, garlic, shallots, snow peas and pepper. A classic stir fried in tasty oyster sauce with garlic and seasonal vegetables. Famous Thai stir fried with roast cashew nuts and authentic chilli jam. Lightly stir fried sliced ginger, seasonal vegetables and shallots in mixed oyster sauce and golden bean base sauce. Stir fried sweet & sour sauce with tomatoes, cucumber, shallots & pineapple. Stir fried mixed vegetables with Thai style peanut sauce. Famous cooking style of stir fried with soy and oyster sauce base and flavoured with minced garlic, pepper and seasonal vegetables. Spicy stir fried with holy basil, fresh chilli, bamboo shoot and mixed vegetables. Roasted duck stir fried with oyster sauce, garlic and seasonal green vegetables. Stir fried ginger and shallots with original Thai honey sauce. Boneless roasted duck cooked in red curry with pineapple, lychee and mixed vegetables. Shredded roasted duck lightly flavoured with chilli jam with Thai salad dressing. The most popular Thai curry with green curry paste, coconut milk, basil, bamboo shoots and mixed vegetables. Curry paste in coconut milk, lime leaves and vegetables topped with crushed peanuts. Red curry paste, coconut milk, bamboo shoots, fresh basil and mixed vegetables. Spicy curry without coconut milk mixed with seasonal vegetables. A well known aromatic yellow curry with broccoli, carrots, capsicum, onion & potatoes. Topped with fried onion. A fabulous mild curry, tender beef cooked in rich aromatic coconut cream with potato and onion. Topped with fried onion. Thai style fried rice with egg, onion, garlic, tomatoes carrots and Chinese broccoli. Stir fried rice with chilli jam and mixed vegetables and egg. Fried rice with garlic, chilli, basil, bamboo shoot and mixed vegetables. Hot and sour stir fried with tom yum paste, red onion, mushroom, tomatoes, egg with coriander on the top. Fried rice with egg, green chilli paste, bamboo, basil and mixed vegetables. Stir fried flat rice noodles with egg and lettuce. Served with chilli sauce. Stir fried thin rice vermicelli noodles with egg, curry powder, bean sprout, onion, light chilli, capsicum, broccoli and shallots. Thin noodle with egg in our special sauce, tossed with bean sprouts, shallots sweet radish and crushed peanuts. A delicious stir fried flat noodle with carrot, Chinese broccoli, sweet soy sauce and egg. Stir fried flat noodle with sweet soy sauce, fresh chilli, egg, basil, bamboo shoot and mixed vegetables. Stir fried flat noodle with chilli jam and seasonal vegetables and egg dressed with cashew nuts. Stir fried hokkien noodle with sweet soy sauce and seasonal vegetables. Thin rice noodle with our special sauce, bean sprouts, bok choy and carrots, topped with coriander, shallots and fried onion. Thin rice noodles with beef and Chinese broccoli, bean sprouts in thick broth, topped with coriander and shallots. Deep fried firm tofu mixed with sweet chilli tossed with mixed salad with Thai herbs and chilli lime dressing. Minced chicken with roasted chilli flakes, ground roasted rice, red onion, mint leaves, shallots, coriander and lemon Thai dressing. Char grilled marinated sliced beef tossed with finely sliced shallots, coriander, mint leaves, sliced red onion, tomatoes, cucumbers, roasted chilli flakes and lemon dressing. Spicy salad mixed with ground roasted rice, shallots, coriander, mint leaves, sliced red onion, tomatoes, cucumbers, roasted chilli flakes and lemon dressing. Grilled prawns topped with salad of ginger, red onion, mint leaves, cucumber, shallots, coriander, chilli and lemon dressing. A spicy piquant soup with chilli paste, mushrooms,lemongrass, kaffir lime leaves, galangal, cherry tomatoes, coriander and shallots. Clear hot and sour soup flavoured with lemon juice, lemongrass, basil leaves, mushroom, lemongrass, kaffir lime leaves, galangal, cherry tomatoes, coriander and shallot.